Students and emerging professionals have the opportunity to sign up for a twenty-minute practice interview at the 2015 Annual Conference in New York. Organized by the Student and Emerging Professionals Committee, Mock Interview Sessions give participants the chance to practice their interview skills one on one with a seasoned professional, improve their effectiveness during interviews, and hone their elevator speech. Interviewers also provide candid feedback on application packets. Mock Interview Sessions are offered free of charge; you must be a CAA member to participate. Sessions are filled by appointment only and scheduled for Thursday, February 12, 11:00 AM–1:00 PM and 3:00–5:00 PM; and Friday, February 13, 9:00–11:00 AM and 1:00–3:00 PM. Conference registration, while encouraged, is not necessary to participate. To apply, download, complete, and send the 2015 Mock Interview Sessions Enrollment Form to Megan Koza Young, chair of the Student and Emerging Professionals Committee, by email to sepccaa@gmail.com or by mail to: 706 Webster Street, New Orleans, LA 70118. You may enroll in one twenty-minute session. Deadline: February 5, 2015. Onsite enrollment will be limited and first-come, first-served. Sign up in the Student and Emerging Professionals Lounge starting on Wednesday, February 11, at 4:00 PM. 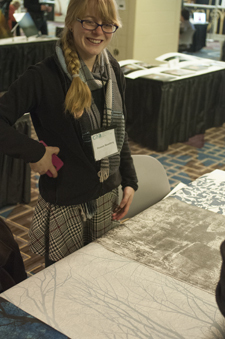 For the 103rd Annual Conference, taking place February 11–14, 2015, in New York, CAA seeks established professionals in the visual arts to volunteer as mentors for two Career Services programs: the Artists’ Portfolio Review and Career Development Mentoring. Participating as a mentor is an excellent way to serve the field and to assist the professional growth of the next generation of artists and scholars. Interested candidates must be current CAA members and prepared to give five successive twenty-minute critiques in a two-hour period on one of the two days of the review: Thursday, February 12, and Friday, February 13, 2015, 8:00 AM–NOON and 1:00–5:00 PM each day. Conference registration, while encouraged, is not required to be a mentor. Please send a brief letter of interest and your CV to Lauren Stark, CAA manager of programs. Deadline extended: January 9, 2015. CAA has filled all the positions for room monitors but is still seeking projectionists. Working as a projectionist or room monitor at CAA’s 103rd Annual Conference, taking place February 11–14, 2015, in New York, is a great way to save on conference expenses. All candidates must be US citizens or permanent US residents. CAA encourages students and emerging professionals—especially those in the New York area—to apply for service. CAA seeks applications for projectionists for conference program sessions. Successful applicants are paid $12 per hour and receive complimentary conference registration. Projectionists are required to work a minimum of four 2½-hour program sessions, from Wednesday, February 11 to Saturday, February 14; they must also attend a training meeting on Wednesday morning at 7:30 AM. Projectionists must be familiar with digital projectors. Please send a brief letter of interest to Lauren Stark, CAA manager of programs and archivist. Deadline extended: December 1, 2014. CAA needs room monitors for two Career Services mentoring programs (the Artists’ Portfolio Review and Career Development Mentoring), several offsite sessions, and other conference events, to be held from Wednesday, February 11 to Saturday, February 14; they must also attend a training meeting on Thursday morning at 7:30 AM. Successful candidates are paid $12 per hour and receive complimentary conference registration. Room monitors are required to work a minimum of eight hours, checking in participants and facilitating the work of the mentors. Please send a brief letter of interest to Lauren Stark, CAA manager of programs and archivist. No more room monitors are needed. CAA offers Annual Conference Travel Grants to graduate students in art history and studio art and to international artists and scholars. In addition, the Getty Foundation has funded the third year of a program that enables applicants from outside the United States to attend the 2015 Annual Conference in New York, which takes place February 11–14, 2015. Applicants may apply for more than one grant but can only receive a single award. The CAA-Getty International Program, generously supported by the Getty Foundation, provides funding to fifteen art historians, museum curators, and artists who teach art history to attend the 103rd Annual Conference in New York. The grant covers travel expenses, hotel accommodations for eight nights, per diems, conference registrations, and one-year CAA memberships. The program will include a one-day preconference colloquium on international issues in art history on February 10, at which grant recipients will present and discuss their common professional interests and issues. Deadline: August 18, 2014. CAA will award a limited number of $250 Graduate Student Conference Travel Grants to advanced PhD and MFA graduate students as partial reimbursement of travel expenses to attend the 103rd Annual Conference in New York. To qualify for the grant, students must be current CAA members. Successful applicants will also receive complimentary conference registration. Deadline: September 14, 2014. CAA will award a limited number of $500 International Member Conference Travel Grants to artists and scholars from outside the United States as partial reimbursement of travel expenses to attend the 103rd Annual Conference in New York. To qualify for the grant, applicants must be current CAA members. Successful applicants will also receive complimentary conference registration. Deadline: September 14, 2014. CAA has begun accepting nominations for the 2015 Awards for Distinction, which will be presented at the 103rd Annual Conference in New York. Please review the guidelines below to familiarize yourself with the nomination process and to download, complete, and submit the requested materials. Deadline: July 31, 2014, for the Charles Rufus Morey Book Award and the Alfred H. Barr Jr. Awards; August 31, 2014, for all others. Nominations for book and exhibition awards should be for authors of books published or works exhibited or staged between September 1, 2013, and August 31, 2014. Books published posthumously are not eligible. Letters of support are not required for the Morey and Barr awards. All submissions must include a completed 2015 nomination form and one copy of the nominee’s CV (limit: two pages); book-award nominations do not require a CV (see below for the appropriate forms for the Morey and Barr awards and the Porter Prize). Please submit copies of critical writings, which may be website links and printouts, photocopies or scanned pages of newspapers or magazines, and more. If the writing is contained in a single volume (such as a book), please provide the publication information. Please write to Lauren Stark, CAA manager of programs, for more information about the nomination process. Visit the Awards section of the CAA website to learn more about the individual awards. CAA invites nominations and self-nominations for individuals to serve on eight of the twelve juries for the annual Awards for Distinction for three years (2014–17). Terms begin in May 2014; award years are 2015–17. CAA’s twelve awards honor artists, art historians, authors, curators, critics, and teachers whose accomplishments transcend their individual disciplines and contribute to the profession as a whole and to the world at large. Nominations and self-nominations should include a brief statement (no more than 150 words) outlining the individual’s qualifications and experience and an abbreviated CV (no more than two pages). Please send all materials by email to Lauren Stark, CAA manager of programs; submissions must be sent as Microsoft Word attachments. Deadline: April 25, 2014. The January 21 and 28 issues of CAA News gave the incorrect URL for the Career Services Guide for the 2015 Annual Conference in New York. Please click here to download and read that document. 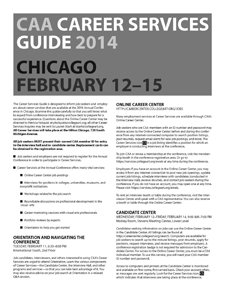 CAA has designed the Career Services Guide to inform job seekers and employers about placement activities at the 2014 Annual Conference in Chicago. The publication, available as a PDF, will help you navigate Career Services events and provides answers to frequently asked questions. Study this guide carefully so that you will know what to expect from conference interviewing and how best to prepare for a successful experience. Printed copies of the Career Services Guide will be distributed onsite at Orientation and in the Candidate Center. All conference Career Services will take place at the Hilton Chicago. For more information about job searching, professional-development workshops, and more, visit the Career Services section of the conference website. The deadline for applications to participate in CAA’s two conference mentoring sessions—the Artists’ Portfolio Review or Career Development Mentoring—has been extended to Friday, January 17, 2014. 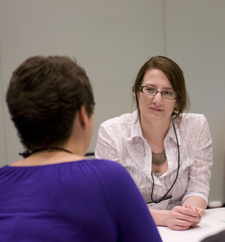 As a CAA member, you have access to a diverse range of mentors at Career Services during the 102nd Annual Conference, taking place February 12–15, 2014, in Chicago. All emerging, midcareer, and even advanced art professionals can benefit from one-on-one discussions with dedicated mentors about artists’ portfolios, career-management skills, and professional strategies. You may enroll in either the Artists’ Portfolio Review or Career Development Mentoring—please choose one. Participants are chosen by a lottery of applications received by the deadline; all applicants are notified of their scheduled date and time slot by email in early 2014. Both sessions are offered free of charge. Conference registration, while encouraged, is not necessary to participate. All applicants must be current CAA members. The Artists’ Portfolio Review offers CAA members the opportunity to have digital images or DVDs of their work reviewed by artists, critics, curators, and educators in personal twenty-minute consultations. Whenever possible, CAA matches artists and mentors based on medium or discipline. You may bring battery-powered laptops; wireless internet, however, is not available in the room. Sessions are filled by appointment only and are scheduled for Thursday, February 13, and Friday, February 14, 2014, 8:00 AM–NOON and 1:00–5:00 PM each day. To apply, download and complete the Career Development Enrollment Form or fill out the paper form in the 2014 Conference Information and Registration booklet, which will be mailed to all individual and institutional CAA members in October 2013. Send the completed form by email to Lauren Stark, CAA manager of programs; by fax to 212-627-2381; or by mail to: Artists’ Portfolio Review, College Art Association, 50 Broadway, 21st Floor, New York, NY 10004. Deadline extended: January 17, 2014. Artists, art historians, art educators, and museum professionals at all stages of their careers may apply for one-on-one consultations with veterans in their fields. Through personal twenty-minute consultations, Career Development Mentoring offers a unique opportunity for participants to receive candid advice on how to conduct a thorough job search; present cover letters, CVs, and digital images; and prepare for interviews. Whenever possible, CAA matches participants and mentors based on medium or discipline. Sessions are filled by appointment only and are scheduled for Thursday, February 13, and Friday, February 14, 2014, 8:00 AM–NOON and 1:00–5:00 PM each day. To apply, download and complete the Career Development Enrollment Form or fill out the paper form in the 2014 Conference Information and Registration booklet, which will be mailed to all individual and institutional CAA members in October 2013. Send the completed form by email to Lauren Stark, CAA manager of programs; by fax to 212-627-2381; or by mail to: Career Development Mentoring, College Art Association, 50 Broadway, 21st Floor, New York, NY 10004. Deadline extended: January 17, 2014. CAA is no longer taking applications for projectionists and room monitors. 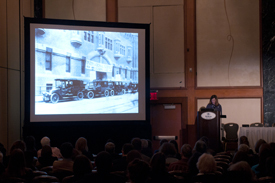 Working as a projectionist or room monitor at the 102nd Annual Conference, taking place February 12–15, 2014, in Chicago, is a great way to save on conference expenses. All candidates must be US citizens or permanent US residents. CAA encourages students and emerging professionals—especially those in the Chicago area—to apply for service. CAA seeks applications for projectionists for conference program sessions. Successful applicants are paid $12 per hour and receive complimentary conference registration. Projectionists are required to work a minimum of four 2½-hour program sessions, from Wednesday, February 12 to Saturday, February 15; they must also attend a training meeting on Wednesday morning at 7:30 AM. Projectionists must be familiar with digital projectors. Please send a brief letter of interest to Lauren Stark, CAA manager of programs. CAA needs room monitors for two Career Services mentoring programs (the Artists’ Portfolio Review and Career Development Mentoring), several offsite sessions, and other conference events, to be held from Wednesday, February 12 to Saturday, February 15; they must also attend a training meeting on Thursday morning at 7:30 AM. Successful candidates are paid $12 per hour and receive complimentary conference registration. Room monitors are required to work a minimum of eight hours, checking in participants and facilitating the work of the mentors. Please send a brief letter of interest to Lauren Stark, CAA manager of programs.